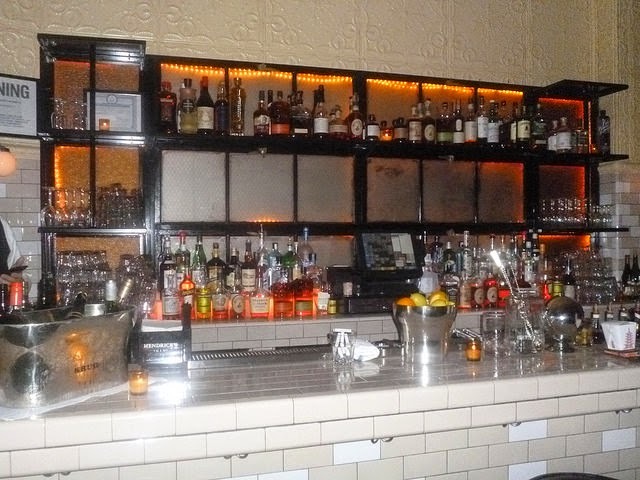 Forays of a Finance Foodie: Chloe 81: A Superlative “Speakeasy” On The Lower East Side Brings You Back In Time! 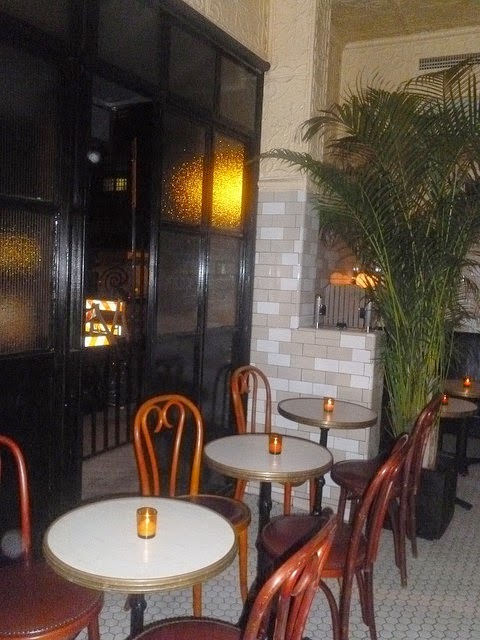 Chloe 81: A Superlative “Speakeasy” On The Lower East Side Brings You Back In Time! I’m not sure if it’s because of the success of Boardwalk Empire (set in the Prohibition Era) or just because hipsters need a new retro movement to follow, but bars and restaurants with a 1920’s speakeasy look have taken over the artier neighborhoods of Manhattan and Brooklyn. Chloe 81 is one of these places—it features a lot of pale yellow subway tile and dim lighting, and actually has a semi-secret club room downstairs that features a bar, dancing and a DJ. I went to Chloe 81 for an early dinner because a crowded 11 PM scene with beautiful people is just not my thing at the advanced age of 53, LOL! They make great specialty drinks and all their mixes/syrups are made from scratch at the bar. Definitely start your dinner off with one of the ten specialties of the house being offered that night (all are priced at $14). I tasted their most popular drink The Chloe, which is a delicious combo of champagne and elderflower liqueur and the Mezcal Mule, a smoky-tasting blend of Mezcal, lime juice and house-made ginger. I swear that the latter not only tasted divine, but it cured my impending cold symptoms. Drinks are served in simple glasses that look like they were manufactured in the Speakeasy Age. The food prices are very reasonable compared to the price of the drinks, and the fare is classically American with large seafood plates five types of oysters (including ones from Nootka Sound, North Bay and Hood Canal) at $2 to $2.50 a pop. The Chloe Platter includes four jumbo shrimp, six oysters, six clams and several King Crab Legs for $55, making it the most ordering item for the health-conscious. The broiled NY strip served with delicious golden fries will only set you back $21 and it’s a big 12 to 14 ounce serving of meat. 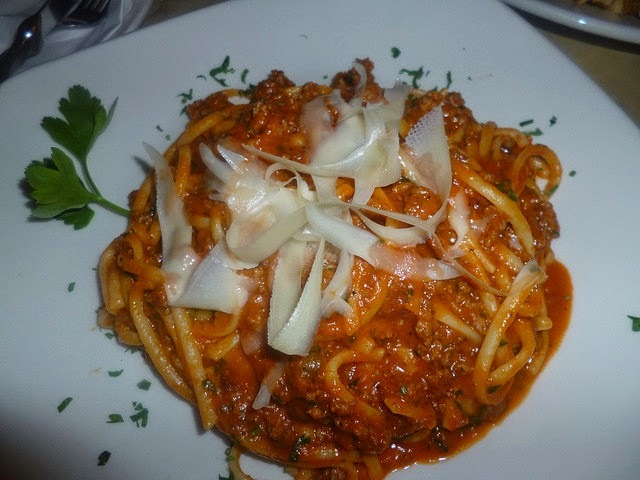 I wanted to do some pasta with my meat, so I ordered the Linguini Bolognese ($16); it was a rather mild version and the portion was quite big (about four to five ounces of dry pasta was used to make it). I loved the massively stretchy, gooey Parmesan cheese that it was topped with; it almost seemed like mozzarella. Let me backtrack for a minute and say that after my cocktails, I headed straight for the Roasted Beet Salad ($9) served with walnuts, goat cheese and balsamic vinaigrette. The beets were fresh and tender and the goat cheese was mild. I loved this salad and would definitely order it if I ever return to Chloe 81. There are generally only three desserts offered at Chloe 81 at one time and they are all priced at a very reasonable $6. 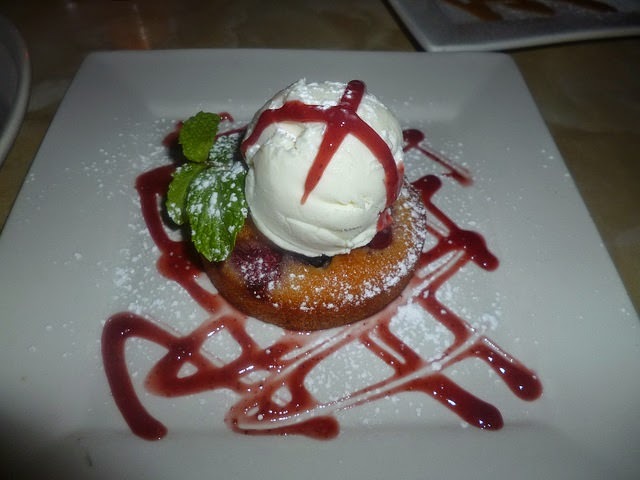 My dining partner Gail and I shared both the Berry Financier (a small round yellow cake with the same texture as a Madeleine, laying in a strawberry sauce) and the Tarte Tartin, which is actually a mini apple upside down cake (laying in a caramel sauce). Both were served with a scoop of divine vanilla gelato from the nearby Il Laboratorio Del Gelato. It’s great that you can get this type of hearty American fare (with French-style desserts including Chocolate Mousse) very late at night—I think it would be romantic to come for Chloe cocktails, a seafood tray and desserts late at night with someone special or just a bunch of BFF’s!